The Hodrick-Prescott (HP) filter is used to detrend time series. This approach was introduced to economists in the work of Kydland and Prescott, it became part of the toolbox used by people who worked in the real business cycle literature, and its use spread from there. Hodrick and Prescott's paper was unpublished for a long time, but appeared eventually in the Journal of Money, Credit, and Banking. In studying the cyclical behavior of economic time series, one has to take a stand on how to separate the cyclical component of the time series from the trend component. One approach is to simply fit a linear trend to the time series (typically in natural logs for prices and quantities). The problem with this is that there are typically medium-run changes in growth trends (e.g. 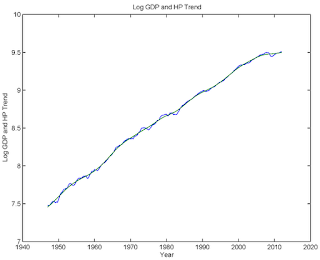 real GDP grew at a relatively high rate in the 1960s, and at a relatively low rate from 2000-2012). If we are interested in variation in the time series only at business cycle frequencies, we should want to take out some of that medium-run variation. This requires that we somehow allow the growth trend to change over time. That's essentially what the HP filter does. You can find a description of the HP filter on page 3 of Hodrick and Prescott's paper. The HP filter takes an economic time series y(t), and fits a trend g(t) to that raw time series, by solving a minimization problem. The trend g(t) is chosen to minimize the sum of squared deviations of y(t) from g(t), plus the sum of squared second differences, weighted by a smoothing parameter L (the greek letter lambda in the paper). The minimization problem penalizes changes in the growth trend, with the penalty increasing as L increases. The larger is L, the smoother will be the trend g(t). Clearly, the choice of L is critical when one is using the HP filter. L=0 implies that that g(t)=y(t) and there are no deviations from trend, and L=infinity gives a linear trend. Kydland and Prescott used L=1600 for quarterly data, and that stuck. It's obviously arbitrary, but it produces deviations from trend that don't violate the eyeball metric. Here's what happens when you HP filter the quarterly real GDP data available on FRED. 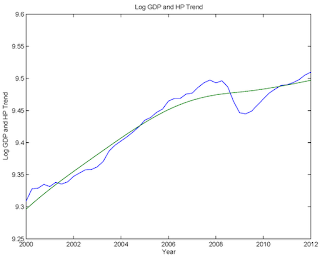 The first chart shows the log of real GDP and the HP trend. You can see in the chart how the growth trend changes over time to fit the time series. 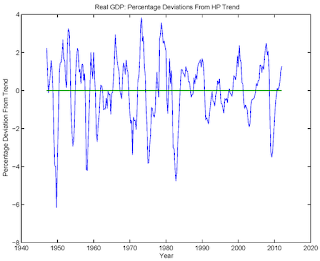 The next chart shows the deviations of real GDP from the HP trend. This last picture doesn't grossly violate the eyeball metric, as it seems more or less consistent with what we think we know about business cycles. The large negative deviations from trend more or less match up with how the NBER defines the business cycle. Of course the NBER committee that dates business cycles is a group of human beings, and the HP filter is just a statistical technique, but it is reassuring if the two approaches are in the same ballpark. Kydland and Prescott's approach to studying business cycles was to: (i) Define the raw time series that we are trying to explain as the deviations of actual time series from HP trends. (ii) Simulate a calibrated model on the computer to produce artificial time series. (iii) HP filter the artificial time series and ask whether these time series look much like the raw time series we are trying to explain. 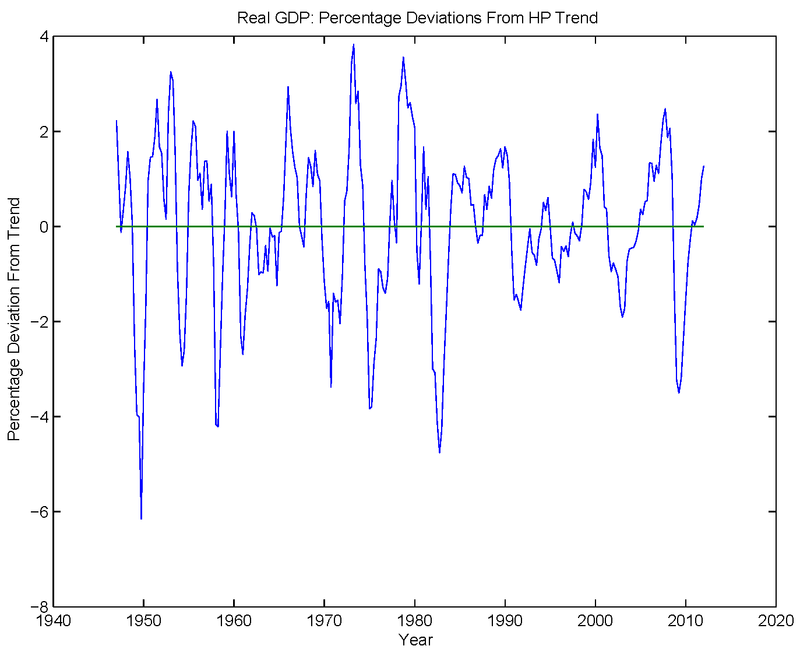 When applied to business cycles, the HP filter finds a smoothed measure of real GDP, which is then taken to represent the economy’s underlying potential, with deviations from this smoothed measure representing unsustainable temporary deviations from potential. I'm not sure if this is just Krugman's misunderstanding, or if this is widespread. In any case, it seems important to correct the misunderstanding. What is the economy's "underlying potential" anyway? It's the level of aggregate real GDP that we could achieve if, within the set of feasible economic policies, policymakers were to choose the policy that maximizes aggregate economic welfare. The HP trend is no more a measure of potential than is a linear trend fit to the data. The HP trend was arrived at through a purely statistical procedure. I did not use any economics to arrive at the two charts above - only a few lines of code. How then could the HP trend be a measure of potential GDP? To measure potential GDP requires a model. The model will define for us what "feasible economic policies" and "aggregate economic welfare" are. If we used Kydland and Prescott's procedure, above, we might construct a model, calibrate and simulate it, and argue that the model produces time series that fit the actual data. We might then feel confident that we have a good model, and use that model to measure potential output. Maybe the model we fit to the data is a Keyesian model, which implies an active role for monetary and fiscal policy. Maybe it's a model with a well-articulated banking and financial sector, with an explicit role for monetary policy. 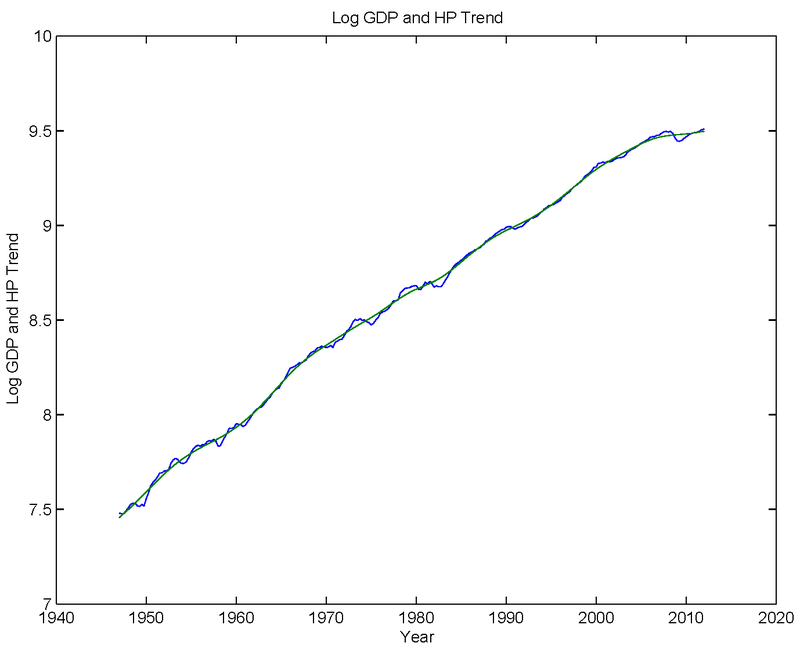 If the model is Kydland and Prescott's, there is a clear answer to what potential is - it's actual GDP (and certainly not the HP trend). That model doesn't have a government in it, and was not intended for thinking about policy. What Kydland and Prescott's work does for us, though, is to allow us to consider the possibility that, for some or all business cycle events, there may be nothing we can or should do about them. But how should we think about potential GDP in the current context? In the second chart above, one curious feature of the deviations from the HP trend is that the most recent recession (deviation from trend close to -4%) appears to be less severe than the 1981-82 recession (deviation from trend close to -5%). This may not be consistent with what we know about the last recession from looking at other data. 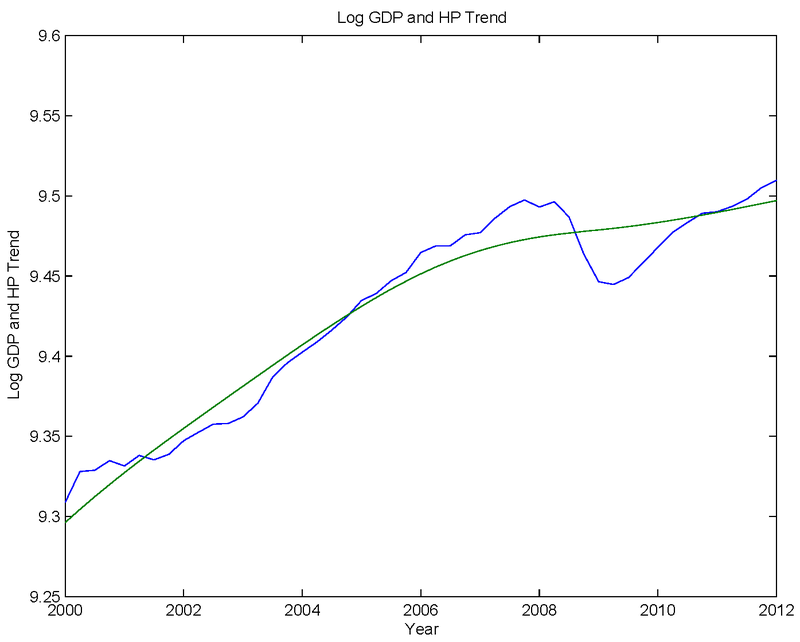 The next chart shows the log of real GDP and the HP trend since 2000. In its attempt to fit the actual time series, the HP filter has done away with part of what we might want to think of as the recession, and real GDP in the first quarter of 2012 was more than 1% above trend. You can see we have to be careful with the HP filter, if we are looking at highly persistent events. You can see this even more clearly for the Great Depression. 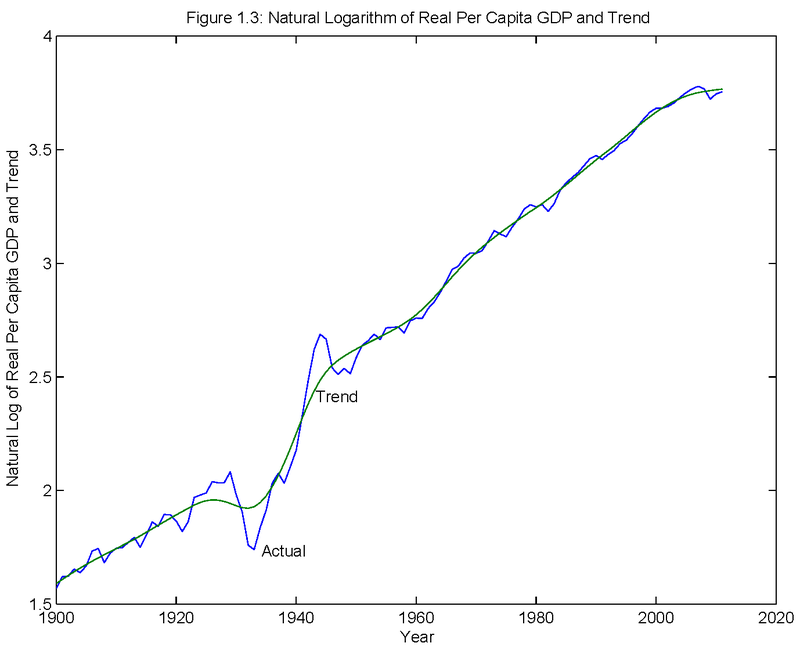 This next chart is from a revision I am doing for my textbook, showing annual real GDP per capita, with an HP trend (L=100) fit to the actual time series. You can see how the trend moves around substantially in response to the GDP data during the Great Depression and World War II - probably more than you might want it to. Of course that depends on how the smoothing parameter L is chosen. 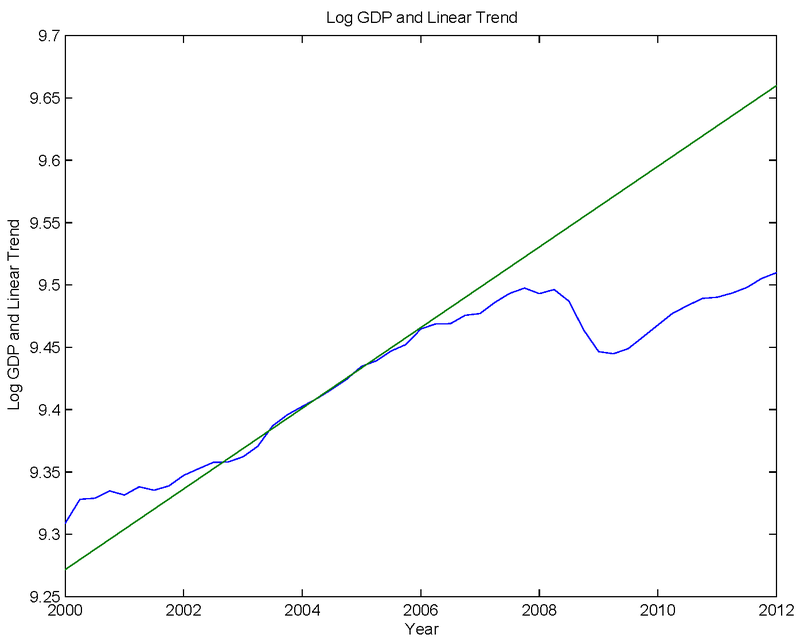 Look at the chart in Krugman's blog post. He's misusing the HP filter here in two ways (though of course what he wants to do is make people who use it look stupid). First, he's using a value for L that's just too small. Second, he's using it to fit a highly persistent event. Back to recent events. 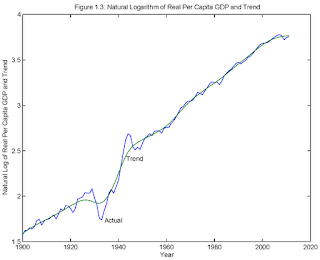 What happens if we fit a linear trend to the post-1947 real GDP data? 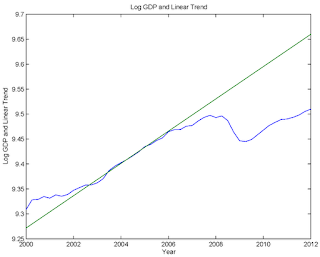 The next chart shows actual real GDP and the linear trend, post-2000. Here, real GDP falls below trend in early 2006, and is about 14% below trend in first quarter 2012. Remember that the HP trend is about 1% below actual GDP. Do either of these trend measures (linear, HP) correspond to official measures of potential output? 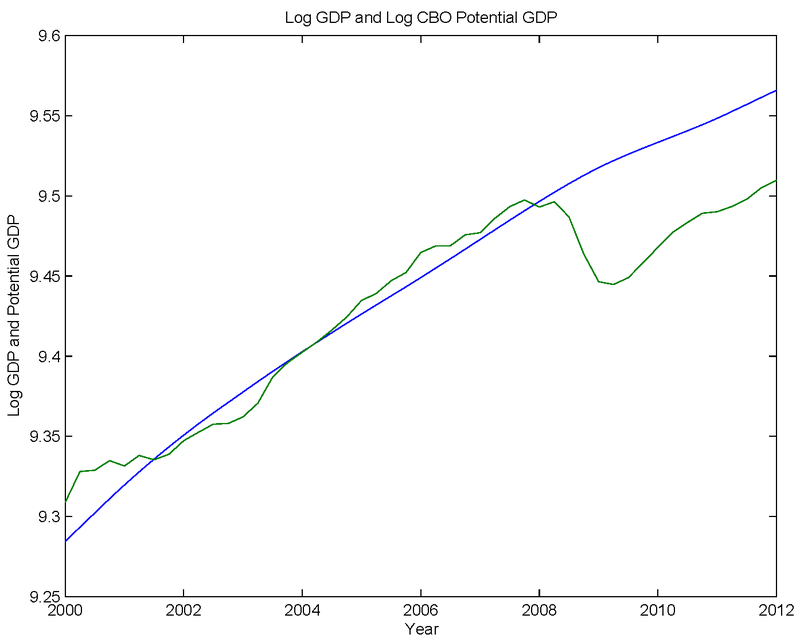 The next chart shows the Congressional Budget Office's measure of potential GDP, along with actual GDP, both in natural logs. According to the CBO measure, real GDP is currently below potential by 5.5% - somewhere between what the HP trend and linear trend give you. 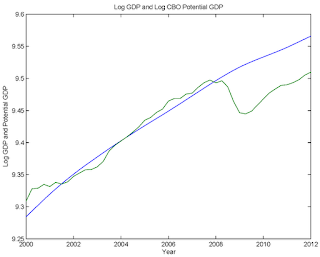 But does CBO potential output do any better than trend-fitting in capturing what we should be measuring? Absolutely not. The CBO does not have a fully-articulated macroeconomic model that captures the role of economic policy. At best, what they seem to be doing is estimating potential based on an aggregate production function and long-term trends in the labor and capital inputs, and in total factor productivity. What we need, in the current context, are measures of the inefficiencies caused by various frictions, and a representation of how fiscal and monetary policies may or may not be able to work against those frictions. Here's another way of looking at the data. 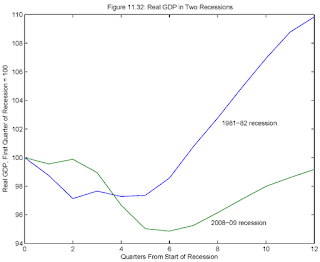 The next two charts show the paths of real GDP and employment (CPS data) during the 1981-82 recession and the 2008-09 recession. In each chart, I normalize the observation at the NBER peak to 100. What's interesting here (if you didn't already know) is the slow recovery in the last recession relative to the earlier one, and the decrease in employment in the recent recession. In the 1981-82 recession, employment falls by a small amount, then resumes robust growth after 6 quarters. 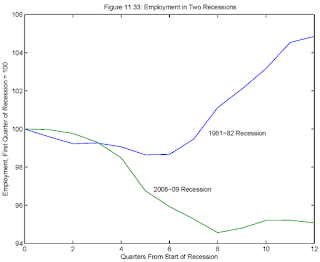 In the recent recession, employment falls by much more, and is still in the toilet after 12 quarters. (i) Wages and prices are sticky. (ii) There is a debt overhang. Consumers accumulated a lot of debt post-2000, the recession has compromised their ability to service that debt, and they have reduced consumption expenditures substantially. (iii) Consumers and firms are anticipating higher taxes in the future. (iv) Sectoral reallocation has caused mismatch in the labor market. (v) Capacity has been reduced by a loss of wealth, or perhaps more specifically, collateralizable wealth. Sticky wages and prices: Come on. 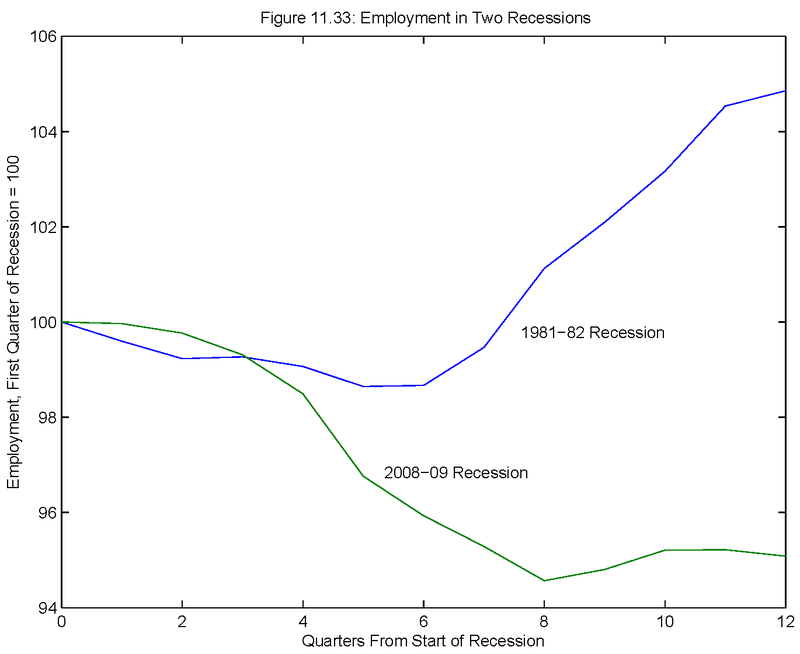 The recession began in fourth quarter 2007, according to the NBER. How can we be suffering the effects of stuck wages and prices in mid-2012? The 1981-82 recession occurred in the midst of a rapid disinflation, from close to 15% (CPI inflation) in early 1980 to 2.5%, post-recession. If there was a time when wage and price stickiness would matter, that would be it. But, as you can see from the last two charts, the 1981-82 recession was short compared to the recent one, with a robust recovery. Debt Overhang: Again, think about the 1981-82 recession. The unanticipated disinflation would have made a lot of debts much higher in real terms than anticipated. If you weren't seeing the debt overhang effect in the 1981-82 recession, why are you seeing it now? Higher future taxes: Look at Canada. There may be a Conservative government there, but they seem committed to social insurance and relatively high taxes. And Canada is gaining ground on the US in the GDP per capita competition. Sectoral Reallocation: This paper by Sahin and coauthors measures mismatch unemployment. They find it's significant, though it's not explaining all of the increased unemployment in the US (maybe a third). Capacity from wealth (collateral): I like this one. Jim Bullard talked about this, though I think the correct story has to do with collateral specifically, rather than wealth. For example, the value of the housing stock is important, as it not only supports mortgage lending, but a stock of mortgage-backed securities that are (or were) widely-used as collateral in financial markets. One dollar in real estate value could support a multiple of that in terms of credit contracts in various markets. Thus, the factors that I think potentially can give us the most mileage in explaining what is going on are ones which are not well-researched. We know a little bit about the mismatch problem, but have really only scratched the surface. What makes credit markets dysfunctional is still not well-understood. We have plenty of different models, and a lot to sort out. The "dual mandate" the Fed operates under includes language to the effect that the Fed should try to achieve maximum employment. Lacker says we're there, and I'm inclined to agree with him. The Fed should feel free to interpret the Humphrey Hawkins Act in whatever way makes the most economic sense. If I define potential GDP as I did above, then maximum employment is whatever level of employment can be achieved if optimal economic policies are pursued, within feasibility constraints. From the point of view of the central bank, there is nothing to be done. Even if you thought that all the factors (i)-(v) above are important, fiscal policy is a constraint for the central bank, and there is nothing to be done on the monetary policy front, for reasons discussed here. Whether real GDP is above or below some trend measure, or above or below CBO potential output is currently irrelevant to how the Fed should think about "maximum employment." We're there. Prof. Williamson, I think Krugman's confusion stems from the view that the trend (HP or othewise) is exogenous. If this is the case then indeed the best we can do is return output to its now-lower trend. But economic theory offers several reasons why the trend may be endogenous, and therefore policy-dependent. In conclusion, I like your definition of potential GDP as the level of output that can be achieved if optimal economic policies are pursued. I'm sorry, I don't understand what you mean by "fiscal policy is a constraint for the central bank"? B) (current) fiscal policy as conducted by treasury is preventing the central bank from doing more? Whatever you mean, can you give some examples? Ben Bernanke cannot tell Congress what to do, so Ben does whatever he does, treating fiscal policy as a given. I don't think your arguments against sticky wages and debt overhang are very convincing. If wages are sticky because of money illusion and a resistance to wage reduction, then what matters is the inflation rate itself, not the rate of change of the inflation rate. i.e., inflation might have been decreasing in the early 80s, but 80s inflation was still much higher than post-2008 inflation. As far as debt goes, leverage was much smaller in 1980 -- the ratio of private debt / GDP was nowhere near the levels just before 2008, so there wasn't a significant debt overhang problem. Overall I find these comparisons between our current situation and the 1980s recession confusing and misleading. The causes were clearly very different, and the solutions will be as well. "If wages are sticky because of money illusion and a resistance to wage reduction..."
Big if. The standard modern approach to sticky wages and prices is what you see in New Keynesian models. For example, in sticky price models, firms know that they can only set prices infrequently, and when they get the chance, they forecast into the future and choose an optimal price. If there is a surprise disinflation, then you get a contraction in output in the New Keynesian model, because the relative prices charged by the firms with stuck prices are unexpectedly high. If you're back thinking about money illusion, then you're not keeping up with the New Keynesians. "As far as debt goes, leverage was much smaller in 1980 -- the ratio of private debt / GDP was nowhere near the levels just before 2008, so there wasn't a significant debt overhang problem." 1. Depends how you measure private debt, I think. 2. The 1981-82 disinflation is huge. I'm not basing my ideas on price stickiness on what the models assume -- in the end the models are the map, not the terrain. I reason about this based on empirical evidence, and I make a distinction between the types of 'stickiness' for wages and prices. I accept the model's logic regarding infrequent price-setting more for price stickiness -- it sounds to me like a reasonable model of the way firms set prices. The goods being sold are not autonomous agents that might dispute their price level. That's not the case with wages -- wage determination is an adversarial process. Evidence seems to support the proposition that money illusion plays a part here -- if it played no part then there should be a fairly smooth distribution of wage changes. Instead you see a large spike for wage changes of exactly zero, with a very small percentage of actual wage cuts. "...wage determination is an adversarial process." Sure, bargaining over anything is adversarial. What does that have to do with nominal contracts. "Instead you see a large spike for wage changes of exactly zero, with a very small percentage of actual wage cuts." I've seen some people make a big deal of this. I can never figure out why. One problem you have for starters is that you're thinking of the labor market as some kind of spot market. Typically labor contracts are long-term. I wouldn't want to make inferences about the nature of the contracts or the non-neutrality of money, for example, by looking at how an individual is compensated from one month to the next, or one year to the next. Why does it matter for this question whether the labor market is spot or long-term? Isn't the important thing that we can directly observe that nominal wages fail to fall at times when they would optimally do so? JSR, you ask, "Isn't the important thing that we can directly observe that nominal wages fail to fall at times when they would optimally do so?" Under what conditions would it be optimal for nominal wages to fall? If prices are tied to costs, then falling wages will give rise to falling prices, and it's unclear whether real wages will fall at all. And there's little reason to believe that, if nominal wages fell, firms could sell the same amount they did when wages were higher. In the meantime, the real burden of debt will rise and bankruptcies will follow. Eventually, real cash balances may rise enough to get things going again, but there will be many avoidable difficulties along the way. "Why does it matter for this question whether the labor market is spot or long-term?" There may be many reasons why an indvididual's wage might deviate from his or her marginal product. Insurance for example, or some implicit agreement about how the costs of training the worker are going to be allocated. The fact that I see a lot of probability mass at the zero nominal wage increase seems to be due to the fact that zero nominal increase results from doing nothing. I don't think it has any economic significance. At any given time, I see a lot of people sitting at their desks, and some other people moving around at different speeds. So what? Ok -- I'm willing to dismiss the probability mass at the zero nominal wage increase. There's still a fair amount of non-zero probability mass, almost all of it above zero, even during times when optimal wage adjustment would be downward. If there is no money illusion, then why does the portion of the labor force that does not "do nothing" so consistently choose wage increases rather than wage cuts? Greg -- I agree we do not actually want wages to fall relative to debt. When I say 'optimal adjustment' I just mean that after an adverse shock, in the absence of monetary easing, we would expect nominal wages to fall. The fact that they don't implies (to me) wage stickiness. Easier monetary policy could allow wages to rise relative to debt while falling relative to output. There is a lot of churning in labor markets. The data you are looking at, I think, is for people who stay in the same job. I can't remember the numbers, but I think average tenure on the job is pretty short, so there is plenty of room for wages to change for people moving from job to job. If the plant closes down and I lose my job, my nominal wage is not sticky. Pretty interesting, and fairly convincing (to me anyway). I don't think the study addresses all your concerns, but it's hard to ignore the large increase in probability of a zero nominal wage increase since the recession began. "...widely-used as collateral in financial markets"
Collateral for what type of activity? The vast majority was highly rated (agencies, AAA-rated structured finance). It was therefore not used to arbitrage credit risk. Instead, the collateral facilitated maturity transformation. Rather than saying we have a, "shortage of safe asset collateral," we could say we have an, "excess of maturity transformation." Why should this be? God certainly works in mysterious ways. Obviously, we are no where close to maximum employment. We could borrow the money and give 8 million people shovels and racks and be better off, so his conclusion that we are close to maximum employment is just reactionary bs. In fact, I am sure his statement, "Given what’s happened to this economy" was stolen from a bright staffer. To the point, where we are now is a direct result of having a Ready, Fire, Aim team (Obama, Summers, and Rhomer, etc.) at the helm. You didn't have to be standing in the sun in July 2008 to understand that confidence was collapsing because of the shock or rising oil prices, falling housing prices, a federal gov't gutted by irresponsible tax cuts, and two wars lost. If Obama had learned something about talking to people other than from Jeremiah Wright, he would have understood that he needed to create a premise for action, against which the success of his policies could be measured. That premise would have been as accurate a written assessment, as then possible, as to what had happened to the economy, one that dealt with cause, not effect. Keynes, I dare say, would have gone nuts at the performance of the Ready, Fire, Aim team. While you are pumping out the flooded compartments, you will never get the ship underway again if you do not also fix the damage to the hull caused by the reef you just smashed into out of the main channel of the Mississippi. As we all,hopefully, learned from Sink the Bismarck!, you have to put someone in a dive suit and throw them overboard into the cold dark North Atlantic to find out if the steering can be fixed and the hull repaired. Here we are, four years later, and the fool is being whipped by a self confessed felon because he is still talking about the water in the hold (jobs) and not why therer are no jobs (oil prices and demographics, as per, e.g., Watson and Stock, 2012). SW, is wrong about 99% wrong otherwise, as is always the case. All that he has right is that there is no friends and family money in the economy. For the illiterate here, friends and family, historically, have financed many new entrepreneurs by taking out seconds on their homes to provide startup and operating cash. Bankers I know haven't made this kind of loan, which was the breach and butter of community banking before 2008, since housing prices collapsed. Ah, you're back John D., no longer hiding as Anonymous. Everyone, he's back and his nonsense is still nonsense. I can't figure out why he posts, it isn't as if anyone cares. Unfortunately the SNR is not (and can not be) estimated but is arbitrarily predetermined. This does not make much sense. There are many ways to detrend your data (e.g. unobserved component models) but the HP filter is probably the least appropriate. There's no economics in the post you link to. This is HP from the point of view of a time series econometrician. The issue from his/her point of view is what frequencies HP filters out. If you really had a view of what the frequencies were, exactly, you might want some kind of band pass filter. Some economists have played with that (Christiano, King, I think). A problem is that there is no business cycle frequency. The Great Depression took a long time to work itself out. Some post-World War II recessions only lasted a few quarters. HP has the advantage of being easy to use and, given the nature of the problem, it seems adequate. You can find plenty of heated debate about it though, involving time series econometricians and real business cycle practitioners, if you search the economics literature. You ask, "If you weren't seeing the debt overhang effect in the 1981-82 recession, why are you seeing it now?" According to World Bank statistics, "domestic credit to the private sector" increased from about 97% of U.S. GDP in 1980 to about 214% of U.S. GDP in 2007. "Domestic credit to the private sector" refers to "financial resources provided to the private sector, such as through loans, purchases of nonequity securities, and trade credits and other accounts receivable, that establish a claim for repayment." I think what people focus on is mortgage debt. Mortgages are important, obviously, in thinking about what happened post-2000, but it's not the debt that you should be focusing on. It's the collateral. When you say we should be focusing on collateral, are you thinking that with less collateral, there will be less borrowing and less spending? I'm sure there are some households and firms that would borrow more if they had the necessary collateral. But a lot of people and companies are reducing their debt, and I don't think that's a collateral problem. Is it just the collateral itself that is important? Or is it the value of the collateral relative to the value of the debt? The aggregate value of collateralizable wealth is important in supporting credit at the aggregate level. Leverage is important, as higher leverage creates problems when the value of collateral fluctuates - default is costly. It's not just "the aggregate value of collateralizable wealth" that's important, but also its distribution. There's considerable explanatory value in the narrative that points to: 1) stagnant real wages; 2) extensive home equity loans undertaken by lower- and middle-income households; which 3) sustained spending that would have been impossible without the housing boom [and lax lending standards]; but which 4) can't [shouldn't?] be reprised. I think post '47 (WWII) trends in the USA are dominated by the families forming, having babies (boom! ), and those kids growing. With a LOT LESS net worth than they had been expecting since about 1995, as most middle income Americans became home owners and had so much Net Worth in the equity in their house. House price equity fall means folks have far less "money for retirement" than they expected. And this drop in Aggregate Net Worth is one reason there is so much less Ag Demand than prior models might predict. The wrong Fed paying interest on reserves now (not during the bubble) dominates collateral, I think. In general, what if the 1995 (or 1990? )-2006 "trend" is unsustainable? Excellent points, Tom, and I agree with all of them. In fact, the trends you mention seem to support the claim that the growing concentration of wealth and income helped cause, and will continue to cause, aggregate demand problems. If you add to a middle class anxious to restore its savings, a large number of people who are living hand-to-mouth with incomes that are falling rather than rising, then you've got a problem. "You can find plenty of heated debate about it though, involving time series econometricians and real business cycle practitioners, if you search the economics literature." A representative example of this is Canova's 'Detrending and Business Cycle Facts' in the JME (1998) with discussion by Burnside and reply by Canova. "What is the economy's "underlying potential" anyway? It's the level of aggregate real GDP that we could achieve if, within the set of feasible economic policies, policymakers were to choose the policy that maximizes aggregate economic welfare." "If the model is Kydland and Prescott's, there is a clear answer to what potential is - it's actual GD"
So US policy has always been optimal? And Kydland and Prescott (who think that the US is a quasi-socialist society) think that? You got to be kidding? No, I'm not saying that. That's what K-P's 1982 model says. "Sticky wages and prices: Come on"
"Sectoral reallocation has caused mismatch in the labor market"
How could sectoral reallocation create unemployment without sticky prices? Could you illustrate it with a few supply/demand diagrams? True. The matching process might take time. But how could there be way more unemployed than vacancies? You mean without sticky prices? There is actually a debate about this. Shimer and Hall claim stickiness helps you match the data. Hagedorn and Manovskii say no. By the way, for annual data Ravn and Uhlig recommend L= 6.25 and not L=100. Also, some serious problems with the HP filter in context of characterizing empirical properties of business cycles were highlighted by Cogley and Nason back in the early 1990s. CN's paper came out in the JDEC in 1995. Yes, I'm just using L=100 so that chart does not look too crazy. sticky prices: definitely, you are not paying attention! as i've noted before, mortgages reflect the (past) price of housing, which are very sticky. basic sticky price theory says when prices revert to market, employment rebounds. That is exactly what is happening in NV, AZ, and CA as the foreclosure pipeline drains (see below). It takes a whopping 700+ days for a house in the foreclosure pipeline, which seems at capacity at about 200-250k foreclosures/month. very sticky! clearly we have a long way to go since the three states lost 300k jobs, but the three states ought to be adding a solid number of jobs in construction by middle next year. overall cons employment is still 30% below 2007, but it its slowing clawing back. Another test of the sticky price theory is that construction employment should rebound in so-called non judicial states faster (because the foreclosure pipeline and home prices are "stickier" in those states). generally that appears to be true. wages are only a small part of the price of housing, so i have to agree i don't see sticky wages alone as the explanation. construction employment will return, maybe 3/4 of the way to 2006 levels, but it will return. and when that happens i sincerely hope you mark your beliefs to market. You're joking, right? House prices have fallen about 35% (nominal) in the last six years, and more in some of the areas you mention, and you're thinking of those prices as sticky? The stickiness you are describing is a costly foreclosure process. It is indeed the case that default is costly for all debt contracts, and particularly for mortgage contracts, where the collateral is very heterogeneous and costly to sell. That matters macroeconomically, but it's silly to think it has anything to do with Keynesian sticky-price or sticky-wage mechanisms. Demand shocks may bring prices in a given sector down relatively quick, but the slow response of the prices of inputs (and perhaps complementary goods) may generate persistent price stickiness. yes, you are looking at it backwards. as a homowner one locks in the price of housing for 30 years. my housing stock and price is fixed. i have signed a contract to pay $x per mo for 30 yrs. when the market price drops substantially (35%) below contracted price, same with any market i consume less. thats textbook Calvo-Taylor overlapping contracts type model. id rather renege and rent. also, same as the textbook model, as the contracts get renegotiated, demand returns (foreclosure). the speed of adjustment depends on contract stickiness. and since those contracts affect bank capital.... high demand for safe assets. This is a different issue. It's not price stickiness in the sense that Keynesians are typically thinking about it. But it's important, I think. Nominal debt contracts matter. An interesting thing is that the nature of mortgage contracts in the US is in part determined by government intervention in the 1930s. For example, in Canada the typical mortgage contract is for five years or less. "For example, in Canada the typical mortgage contract is for five years or less." i don't think thats 100% accurate. The *term* of a typical mortgage contract in canada might be 5 years, but the amortization period is 25 years. When the term is up, you must renew your mortgage on the remaining principal. The most common *term* is 5 years, but the most common *amortization period* is over 25 years. The "duration" of a US mortgage is also very low - people refi or move making the effective duration of a US mortgage under 4 years typically. The interest rate is not relevant - its the principal outstanding that matters, and with a 25-30 amortization period, you only pay down a small amount of the balance over 5 years. However, you cannot move, refi, or rollover any mortgage in the US or Canada if the principal is higher than the value of the property. "is over 25 years." -> should be "25 years"
as to your point about "overlapping contracts" not being what Keynesians think of as "sticky prices"... fair enough, but my point is that the housing market, having lots of overlapping-but-forward-looking price contracts, will exhibit the same dynamics as any model with overlapping contracts. In the housing market the contracts are much harder to renegotiate. Since its a large share of the economy and 66% of americans are homeowners, the dynamiccs of that one market with have a deep impact. But more importantly, those same overlapping contracts models predict that when contract prices are mostly renegotiated to market (through turnover or whatnot), demand largely returns. the population is growing, eventually demographics and economics will take over. what would help accelerate that process is much higher nominal income growth. "The unanticipated disinflation would have made a lot of debts much higher ..."
Disinflation is not deflation. Were inflation expectations really that much higher than inflation already was? Ongoing inflation (even if not quite as high as before) still makes the real debt load lower. Not as much lower as expected? Evidence? You could calibrate a lot of models to fit well the same data. You could make a model that says it’s only technology shocks that cause recessions and depressions. Assume that technology is jumpy enough, and it will fit well the data. The problem is, does the other empirical and other evidence say technology isn’t in fact anywhere near that jumpy, or consequential to employment. Or, you could make another model that says people’s desire to work is the sole reason for recessions and depressions, and you could calibrate a desire to work parameter jumpy enough that this model fits the data well. Except there’s a ton of empirical and other evidence that people’s desire to work is not like this, that the Great Depression was not the Great Vacation. I’m sure you could have an invisible magic fairies model that if you calibrate the behaviors and powers of the fairies just right, could fit the data well. In finance, luckily we resist this “calibration evidence”. Popular models, when they were calibrated to explain the premium on equity, fit the data, but with ridiculously high risk premium parameters that are contradicted clearly by other evidence. Instead of accepting those calibrated models, the field at least called this a puzzle, the famous “equity premium puzzle”. Part of the problem is that we don’t care about just GDP, at all. We also care about unemployment. 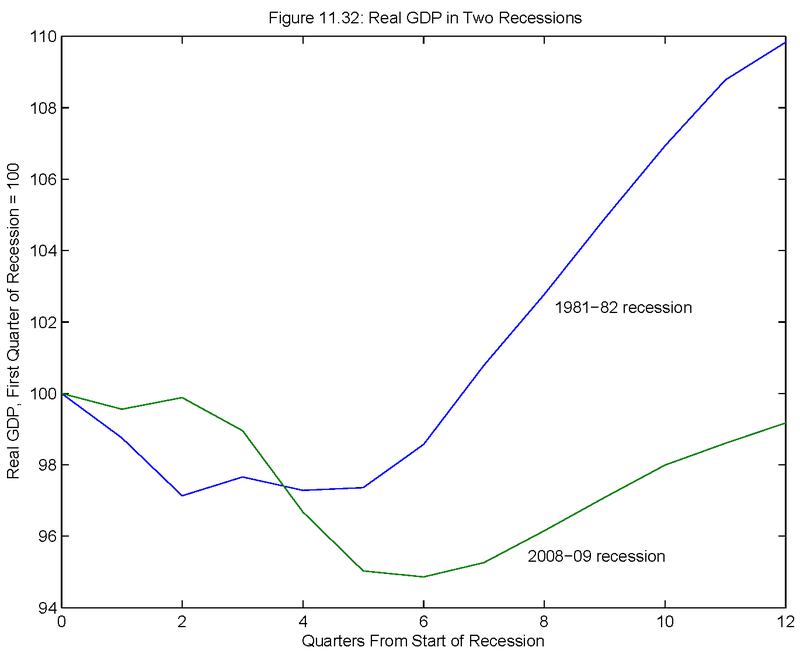 By the GDP definition we aren’t even in a recession, let alone the Great Recession. For people who care about unemployment, we’re still deep in recession. We need a definition for recession/depression that actually takes into account, you know, UNEMPLOYMENT! To see if the early 80s recession was worse, for most people the crucial comparison is unemployment, and how long, not GDP growth. In fact with our current definition of recession/depression, unemployment could be 30% and if we have two quarters of GDP growth from the 70% who do have jobs, economists would say the Depressions over! You ridicule the sticky wages idea, but you never even mention nominal wage cut resistance, which you could imagine lasting for many years. You say if anytime you’d see wage stickiness, it’s in the 80s recession when inflation went from 15% to 2.5%, but it’s the exact opposite with nominal wage stickiness. Average inflation during that period was higher than this time, so resistance to a nominal wage cut meant nonetheless more of a real wage cut. You’re going to ridicule sticky wages, then acknowledge one of the biggest reasons posited for it, resistance to nominal wage cuts, and give us your evidence for why this is not that strong or long. Cite the papers. "You ridicule the sticky wages idea, but you never even mention nominal wage cut resistance, which you could imagine lasting for many years." I can imagine ninjas with wings who attack goblins in a war occurring entirely within my left nostril as well. Imagination is fun! Like inventing positional externalities to justify taking successful people's money. Perhaps because the Fed wasn’t in a liquidity trap. They could slash real interest rates deep into negative terretory. This doesn’t have to be the only factor to still be an important one. SW, given the errors in your past inclinations (inflation, interest rates, etc.) whatever makes you think you are right on this one, especially as you are so wrong on the facts. The gov't need only borrow a very few billions at nominal interest, buy rakes, and employ millions at minimum wages. We have an aggregate demand problem. And you have a mental problem, John D.
Allan Meltzer, is that you? So SW has been ghosting your columns for the WSJ? I'm certain Allan has better things to do than bandy words with a halfwit. Using SW's own definitions, "we're at maximum employment" is logically only a statement that present policies are valued above all others. The basic arguments are circular - ending up back at a value judgment. If you think we're at maximum employment by SW's definition, then you believe present policies are "optimal" and "maximize aggregate economic welfare" so we are at our potential GDP. However, if you value the policies as suboptimal, then voila, we are no longer at maximum employment and something can be done. Also, SW has managed to effectively define the Fed's employment mandate as meaningless. In effect, as long as the Fed believes it is doing the optimal thing it is, by definition, doing the optimal thing. And here I thought it was only the Supreme Court that could interpret a law away. So your argument is that the Fed must think it can do something but chooses not to, therefore imposing (according to its own subjective assessment) suboptimal policies. I think the tinfoil may be frying your brain. Suggest you read more carefully - I don't have an argument for whether or not the Fed policy is optimal or suboptimal or the relationship between fed policy and employment - I'm simply pointing out that SWs argument is circular and cannot be used to claim we are at maximum employment. Not sure why you felt the need to go ad hominem - what I proposed is a serious logical flaw in SW's argument. Do you have a serious rebuttal - or just fixated on anonymous insults? Scott Sumner asks whether your models assume rationality, and if so how you can justify setting aside the EMH in claiming that markets have underpriced the risk of inflation. I'm not sure what you mean (or what he means, for that matter). Certainly reassuring to know being that I'm still unemployed. If things are now optimum guess I'm SOL. "Given that the IROR cannot be negative, does this mean we are stuck with the zero lower bound, and the relative price distortions that are the concern of New Keynesians? Well, no. As discussed in this speech by Narayana Kocherlakota and in this paper and this one, fiscal policy gives us a lot of flexibility. Basically, in New Keynesian models, the problems created by sticky prices are relative price distortions which lead to a misallocation of resources. What could be more natural than correcting such distortions with fiscal policy, given a sufficiently rich array of taxes?" As one of the many unemployed certainly encouraging words. The economy as it is is optimum. Guess I'm SOL. He goes into (his theory of) the origins of the business cycle about 44 minutes in, (the individual loan process + herd psychology) but watch the whole movie. While in Canada tax receipts are 31.1% of GDP while in the United Sates it is 24%. To me this suggests the potential for tax increases is greater in the United States than in Canada. "I see that Canadian government expenditures are 44.1% of GPD while in the United States it is 42.2% (not as far apart as some might suspect)"
This number is so insanely wrong as to be impossible to understand. That website (which I refuse to visit) must be some right-wing nutfarm. So I looked around a bit and cannot find evidence to support the claim that the numbers are insanely wrong. The deficit as a percent of GDP for the federal government alone has been 10.1%, 9.0% and 8.7% for the years 2009-2011. It still seems to me that the fear of future taxes stems not from the level of spending but from the gap between revenue and spending. Deficit =/= spending. Spending in the US by the federal government has only been around 7 percent of GDP, plus transfers that might get you to 18 percent. Add state/local you get to just under 30 percent. Not 40+ percent. That is, the numbers are retard-crazy.